We know how important it is that our customers receive the most up-to-date advice, so you will find that we are all dedicated to improving our current knowledge base through continuing education. All of our vets and nurses regularly attend conferences and seminars, and all of our nurses at Casula Vet Hospital and Elizabeth Drive Animal Hospital are fully qualified with Certificate IV in Veterinary Nursing. We can also provide multi-lingual veterinary service in English and Chinese (Cantonese and limited Mandarin). PennHIP radiographs to test your dog's susceptibility to hip dysplasia. We are fully equipped to look after all of your pets' needs. We offer radiography, ultrasonography, endoscopy, in-house pathology, surgery facilities and a separate isolation ward for infectious diseases. We can also transport patients between our two hospitals and have canine and feline blood donors that live on site with us, allowing for emergency transfusions at any time. You'd like you to feel right at home here when you visit us at our hospitals. Feel free to take a hospital tour. We also do our part for the environment. You will find that we have recycling bins around our two practices, and also print on double-sided paper. Our computer waste is donated to Computers for Young and Old and are given back to the less fortunate (students, elderly, disabled and disadvantaged). We try to give back as much as we can. Would you know what to do if your pet stopped breathing or suffered a fracture? In an emergency situation, effective first aid can minimise injury and even save lives. Knowing what to do makes all the difference. First Aid for Pets Australia has been designed specifically to be easy to use in emergency situations, featuring first aid tips for over 130 conditions that can potentially affect cats and dogs, from toxins to trauma and medical emergencies. Our contact details and a map are included, so that you won’t even need to look up our number – and you can find us when you need us quickly. 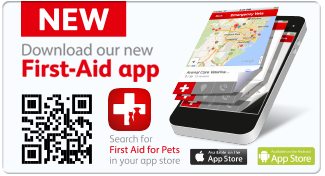 Download it today and select Casula Veterinary Hospital or Elizabeth Drive Animal Hospital. Casula Veterinary Hospital & Elizabeth Drive Animal Hospital are here for you in the Liverpool area. We’re open 6 days a week, please call to make an appointment for consultations.